Pfc. Jay Harvey won the award for Region 1. Pfc. Jay Harvey joined the SCDNR family in 2013 and is assigned to Unit 1F in McCormick County. 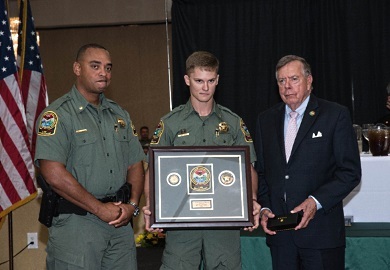 His supervisor writes that "PFC Harvey is the epitome of a true Officer of the Year. He demonstrates both professional and personal excellence." Pfc. Harvey demonstrated his resourcefulness this past year by using social media to track down an offender. 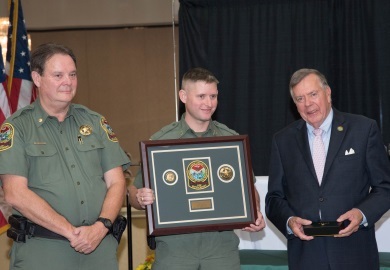 After successfully prosecuting an individual for the illegal transport of wild hogs across county lines, he learned the same subject was continuing to hunt while under suspension. Pfc. Harvey used the location feature on Facebook to get GPS coordinates from hunting videos that the suspect was posting. From these coordinates, he was able to locate the suspect and charge him for hunting with a suspended license. Another example of his dedication to the job is his work with Palmetto Pride and litter. Pfc. Harvey received a grant through the Palmetto Pride Zero Tolerance litter campaign to purchase binoculars and several plot watcher cameras to work litter cases in his local unit. His unit put this equipment to good use and was awarded the Zero Tolerance Achievement Award. He was personally responsible for making 43 littering cases as a part of this effort. During this past year, Pfc. Harvey wrote 164 summons, 339 warnings, and had 135 assists. He checked 450 hunters, 77 fisherman, and logged 373 hours of night patrols. Pfc. Harvey is an asset to this unit, the South Carolina Department of Natural Resources, and the State of South Carolina. Jay is married to his wife Katherine of three years and they have one son named Mac. Congratulations to Pfc. Harvey, Region 1 Officer of the Year! Pfc. Matt Owen won the award for Region 2. Pfc. Matt Owen joined the SCDNR family in 2014 and is assigned to Unit 2A in Chester County. His supervisor describes him as dependable, determined, and that he can always be counted on to get the job done while giving 100 percent in each situation. Two cases that set Pfc. Owen apart from others occurred this past year. He responded to a night hunting complaint one evening and located where a deer had been dragged from a field after being shot illegally. The only evidence he recovered at the scene was a single store receipt that had been dropped where the deer had been loaded. Some officers may have ignored this, but Pfc. Owen pressed on with his investigation. He located the store where the receipt had been printed and determined the time of the purchase. From there, he pulled video from the store parking lot, as well as security camera footage from a nearby school. These videos allowed him to have a clear description of a truck and two subjects. When the two individuals were interviewed and presented with the evidence, they both gave written statements that led to successful convictions. Pfc. Owen's conviction and determination to get the job done are evident in this case. In addition to his regular duties, Pfc. Owen also serves as a member of the SCDNR Dive Team. He spent 54 hours diving in waters across the state to bring closure to families dealing with tragedy. During this past year, Pfc. Owen wrote 105 summons, 160 warnings, and had 68 assists. He checked 313 hunters, 460 fishermen, and logged 283 hours of night patrols. PFC Owen is an exceptional officer who always accepts responsibility, holds himself accountable, and remains productive. Matt is married to his wife Merrick of nine years and they have one girl named Harper. Congratulations to Pfc. Owen, Region 2 Officer of the Year! Pfc. 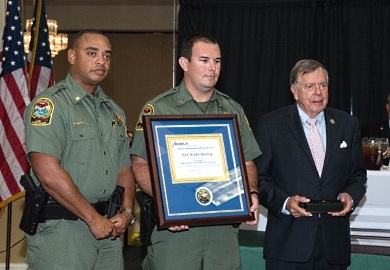 JB Smith also won the overall award of Wildlife Officer of the Year. Pfc. JB Smith won the award for Region 3. Pfc. 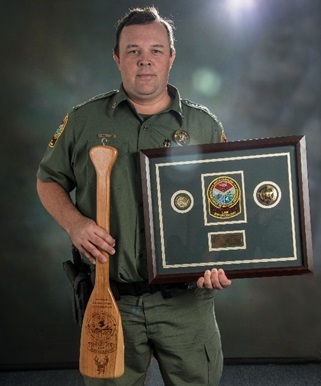 JB Smith joined the law enforcement division in 2013 from the SCDNR Wildlife and Freshwater Fisheries Division and is assigned to Unit 3B in Richland County. His supervisor describes him as a dedicated officer with a positive attitude. One case this past year that sets Pfc. Smith apart from others is a case he made for the illegal dumping of deer. He began seeing a pattern of illegally dumped deer carcasses that were geographically centered around one particular commercial deer processor. He utilized multiple black-out cameras at different dump sites over the course of two deer seasons until he was able to gather enough evidence to successfully bring charges against the owner of the commercial deer processing business. By using cameras set at strategic angles, Pfc. Smith was able to positively identify the processor and his vehicle, as well as get pictures of the buckets loaded with deer carcasses as they were being dumped. This case brought a successful end to a serious litter situation on multiple properties. Pfc. Smith is also great at public relations and educating sportsmen. This past year, he recognized a huge increase in the number of citations being issued to the Burmese community for fisheries violations involving taking gamefish with a cast net, harvesting undersized striper, harvesting undersized smallmouth, and harvesting more than the limit of gamefish. The resulting fines for these violations had reached thousands of dollars. Instead of continuing with heavy enforcement, Pfc. Smith implemented another solution. He organized a meeting with the Burmese community at a local church and arranged for an interpreter to educate them about fisheries and wildlife laws. The presentation included freshwater fish identification cards, fisheries rulers, and the SCDNR rules and regulations. Since this meeting, violations from the Burmese community have dramatically decreased. His efforts to educate the public in this case serve as an example for others to follow. In addition to his high case load, Pfc. Smith is an active member of the SCDNR Dive Team, working 29 dive assignments which resulted in 270 hours assignment hours for body and evidence recovery. During this past year, Pfc. Owen wrote 64 summons, 163 warnings, and had 32 assists. He checked 186 hunters, 183 fishermen, and logged 474 hours of night patrols. While his numbers may not seem like a lot, it is JB's attitude toward his cases and the types of cases he makes that separate him from other officers. JB is engaged to be married to Courtney Shimeck in the near future. 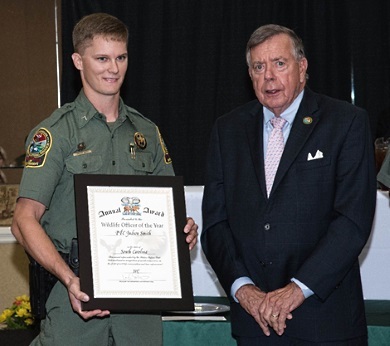 Congratulations to PFC JB Smith, Region 3 Officer of the Year, and also the Wildlife Officer of the Year! Lance Cpl. Jeff Day won the award for Region 4. Lance Cpl. Jeff Day joined the SCDNR family in 2007 and is assigned to Unit 4E in Lower Charleston County. His supervisor describes him as a master at the art of surveillance and patience. These attributes along with his persistence and drive have led to an abundance of cases in the past year. One case that separated him from others occurred this past year. After charging a commercial fisherman for untagged shellfish in January, Lance Cpl. Day discovered the same fisherman was stealing shellfish harvest cards from a popular local seafood restaurant. The subject was illegally harvesting shellfish from commercial leases and storing them at his residence without temperature controls. Lance Cpl. Day conducted extensive surveillance of the suspect's activities, from the harvest to home, then on to private oyster roasts that he was catering. After gathering all the evidence, Lance Cpl. Day was able to charge the suspect with two counts of conspiring to violate state and game fish laws in addition to many other DHEC charges. As a result, he was also able to stop the illegal harvest, as well as prevent these potentially deadly oysters from reaching the public. 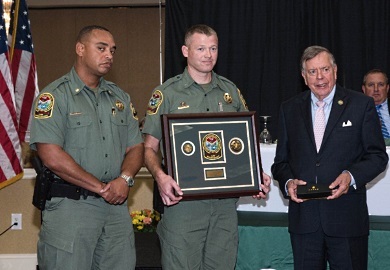 In addition to his regular duties, he annually attends the Special Olympics ceremony in Charleston Harbor, as special needs children hold a place near and dear to him and his family. Lance Cpl. 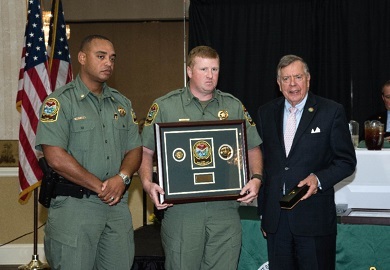 Day has also proudly served on the SCDNR Honor Guard for three years, where he has become a go-to member of this important team. During this past year, Lance Cpl. Day wrote 48 summons, 172 warnings, and had 40 assists. He logged more than 350 boating hours, inspected more than 900 boats, and worked 300 hours of night patrols. Lance Cpl. Day's teamwork, dedication, and public outreach are truly a valuable asset to the South Carolina Department of Natural Resources. He is engaged to Emily Jackson and they plan to be married on Nov. 4, 2017. Congratulations to Lance Cpl. Day, Region 4 Officer of the Year! Investigator Michael Brock won the award for Education/Investigations. Investigator Michael Brock joined the law enforcement division in 2006 and is currently assigned to the Investigations section in Region 4 South. Prior to his promotion to investigator, he served as a dispatcher in Columbia and then a field officer in Region 4 until 2016. His supervisor describes him as an easygoing and intelligent officer who has a knack for peeling back the layers of any investigation. One of the most important jobs he has accomplished this past year has been partnering with Beaufort County to address the abandoned boat problem in Hilton Head and Beaufort in the wake of Hurricane Matthew. He has handled the posting, recovery, and notification efforts for 46 boats that were washed away during this hurricane. Thanks to his efforts, all 46 boats have been removed from the waterways. In addition to this tremendous task, he has taken on the responsibility of reviewing and reporting ALL annual boating accidents to the U.S. Coast Guard. To date, he has entered 134 boat accident reports for 2017 in addition to reviewing 48 nonreportable accidents. In spite of these extra duties, Investigator Brock has successfully closed 50 of the 70 marine theft investigations to which he has been assigned. This past year, Investigator Brock wrote 26 summons, 69 warnings, and had two assists. He logged 31 hours of hunting accident investigations along with 440 hours of boating accident investigation. Investigator Brock is an intelligent officer who is organized in all of his activities. He is married to his wife Sarah of 13 years. They have two children: a daughter, Alex, and a son, Lidge. Congratulations to Investigator Brock, Education/Investigations Officer of the Year! Pfc. Blake Baxley won the award for NASBLA. Pfc. Blake Baxley joined the SCDNR Family in 2015 and is assigned to Unit 3G in Clarendon County. His supervisor describes him as an exemplary officer concerning every aspect of boating safety. He takes a great deal of pride in educating the public on safe boating and the boating laws through public presentations, courtesy boat inspections, and through distributing SCDNR literature. This past year, Pfc. Baxley gave more than 15 public presentations on boating safety. He is exceptional at locating impaired boat operators, conducting field sobriety tests, and making arrests when necessary. This past year, PFC Baxley made six cases for boating under the influence and assisted with another. In addition, he logged more than 103 hours of search and rescue missions. He constantly goes above and beyond the normal call of duty. A perfect example of this occurred one cold afternoon during waterfowl season. Pfc. Baxley received a call about two young boys stranded in the middle of a storm with a small craft advisory in effect on Lake Marion. They gave their location and voiced that their jonboat was taking on water. Pfc. Baxley immediately responded to the call and was on the water within 20 minutes. As he made his way to their location, his center console boat also took on large amounts of water from heavy rain and the waves coming across the bow of his boat. He was finally able to locate the boaters, but their boat was completely submerged. The young boys were holding on to a tree, trying to stay above the water to survive. Pfc. Baxley was able to safely get both of them out the water and back to land. This selfless act truly displays his heroism, courage, and character. During this past year, Pfc. Baxley wrote 95 summons, 334 warnings, and had 56 assists. He completed 367 hours of boat patrols in his patrol area and inspected 1,061 boats. He is truly the epitome of a hardworking, dependable, dedicated, and motivated officer. Pfc. Baxley is engaged to Kristian Pritchard and they plan on being married in March 2018. Congratulations to Pfc. Blake Baxley, our National Association of State Boating Law Administrators (NASBLA) State Officer of the Year!